We're not big on efficiency here among the leaves. As I've mentioned before, I have a tendency to misplace plant tags. I don't keep formal records of my plants, or of plant-related information or tasks, though I've made half-hearted attempts at spreadsheets in the past. I do have an excellent memory for the most part, but there are times when it fails me. Apparently this time it has failed me spectacularly. I don't remember where I purchased this plant, or how long I've had it. It doesn't particularly bother me that I don't have an ID for it now; it does bother me that I don't remember if I ever had an ID for it. I'm inclined to think that it is an Echeveria or a Graptoveria. The leaves suggest the latter to me, however the flowers are very Echeveria-like. Three views of the flowers. In form, they look exactly like the flowers of all the other Echeveria varieties I grow, and the color is similar as well. If anyone knows what this is, I'd be happy and grateful to hear from you. In the meantime, I think I'll have another go at making a spreadsheet to keep track of things. Could it be Echeveria 'Black Prince' seen HERE??? I mean 'Black Knight'! Sorry. It's not Black Knight I don't think. It is definitely some type of Echeveria - possibly agavoides?? They are hard to ID! Whatever it is, it's lovely! 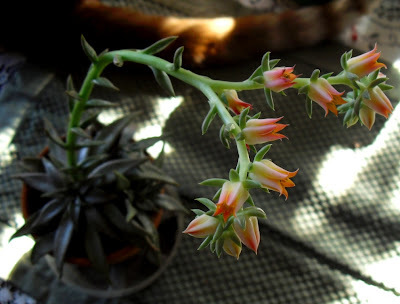 I just love Echeveria blooms, so I'm going with an Echeveria as well. Any of my Graptovaria (think I got the spelling wrong) that bloom are always much smaller than my Eche's. I'm not sure how I missed all your posts...I was just wondering where you were and it was me that was missing! Going to get caught back up now. Meant to say something about your spreadsheet idea. Not So Angry Red Head had a great idea about using an index card system for tracking. I'm going to tweak it a little for me and start a 3 ring binder...that way I have room to put a picture of the plant and make notes as I need them. I'm good about cataloging them in my computer picture files, but that only gives me the name at a glance. The Mystery Plant does however, resemble a couple of other plants on that page, especially Echeveria agavoides x 'Black Prince', so I'm thinking that Drought Smart Plants is onto something. 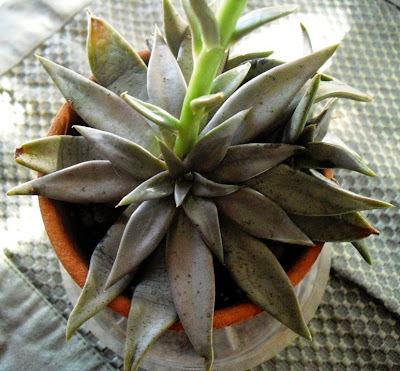 It could well be an E. agavoides cross or cultivar. So thank you, as well. Mandy Welcome back and thanks for the ideas. Hi ya! I think you might have a hybrid there. Very nice. 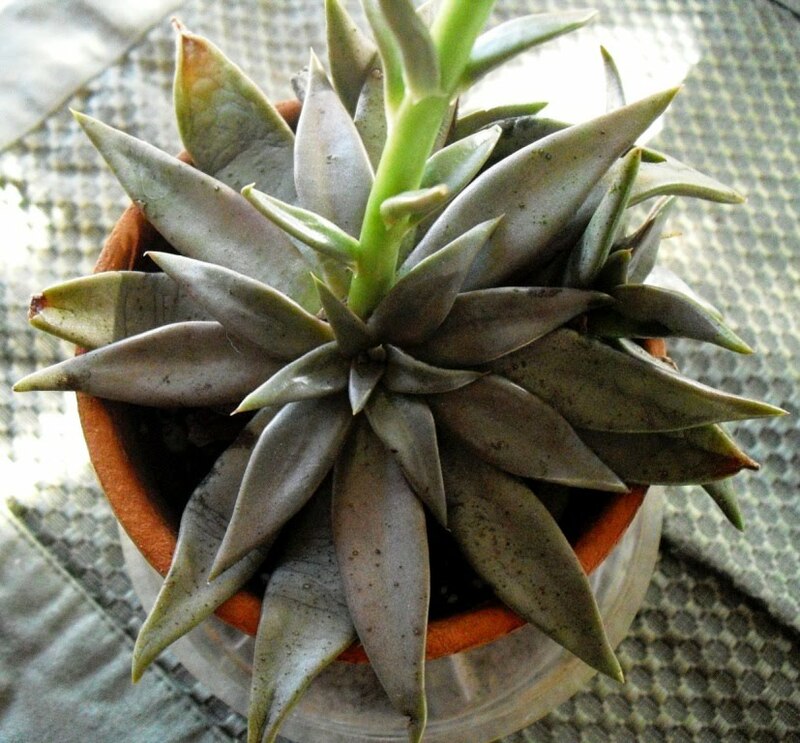 Looks like a combo between agavoides and black knight. I think everyone is leading you in the right direction. It is fairly dark so it does not fit with agavoides.